Hello and welcome to edition 50 of the Railwaymedia blog covering another 5 day trip abroad, this time principally to Austria to see the Mariazellerbahn but with also a quick trip over the border to Hungary in search of former BR Class 86s and GYSEV Ludmillas. It will be a long blog and I make no apologies for the fact most of the included pictures will be of just one type of engine! In a way, much of the information in this blog will be academic by the time you get to read it. 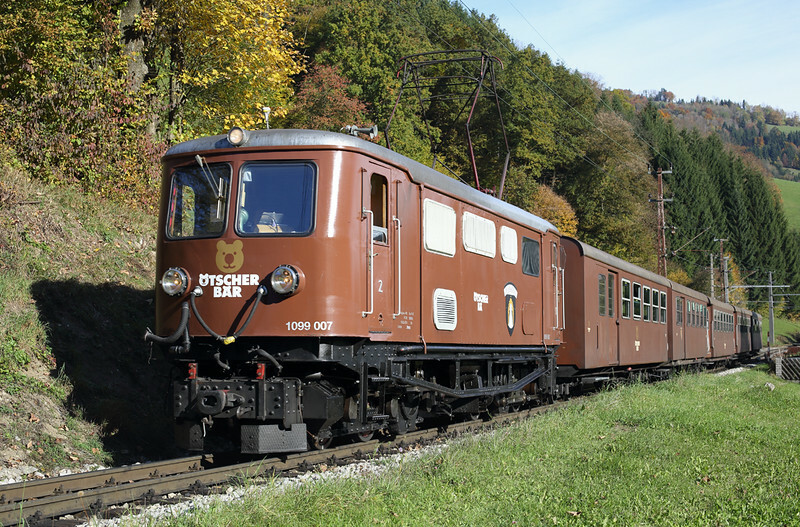 The Mariazellerbahn, which is an 85km long narrow guage line running from St Pölten into the mountains to Mariazell, has for the last 102 years been operated by OBB's class 1099 electric locos dating from 1911, accompanied by an assortment of units and diesel locos. 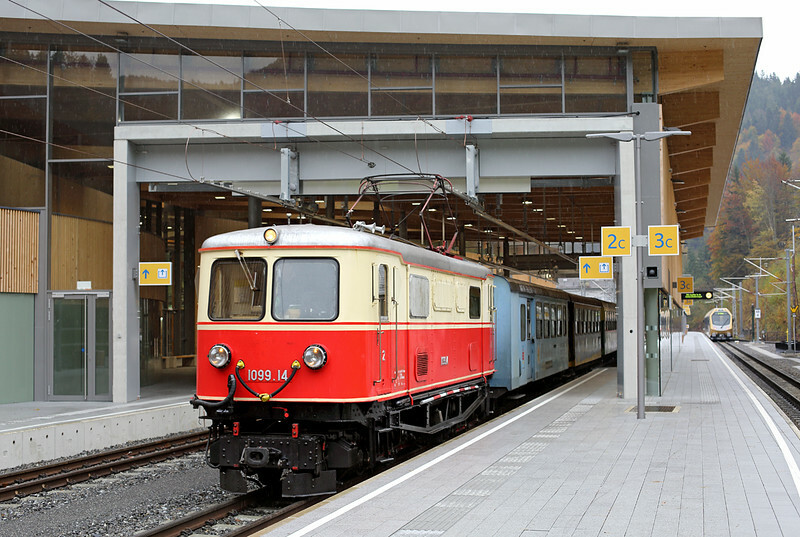 The regional Government took over the line from OBB in 2010 and have invested over €100 million in the line, not just on the infrastructure but also on 9 new units built by Stadler called 'Himmelsteppe' ('Stairway to Heaven'). The apparently silly name is a reference to the fact that Mariazell is a pilgrimage centre. The influx of these units, due for completeion this December will mean the end of day to day running of the class 1099s; already there are no booked trains hauled by the 2095 diesel engines and the new winter timetable starting next week (28th October) will eliminate the last of the loco hauled workings, though the Otscher Bar tourist train (pictured above) will return for one round trip daily next summer. Despite there being just two 1099 return workings left I managed a fair few pictures of them over the 5 days, some will be included in this blog the rest can be viewed HERE. 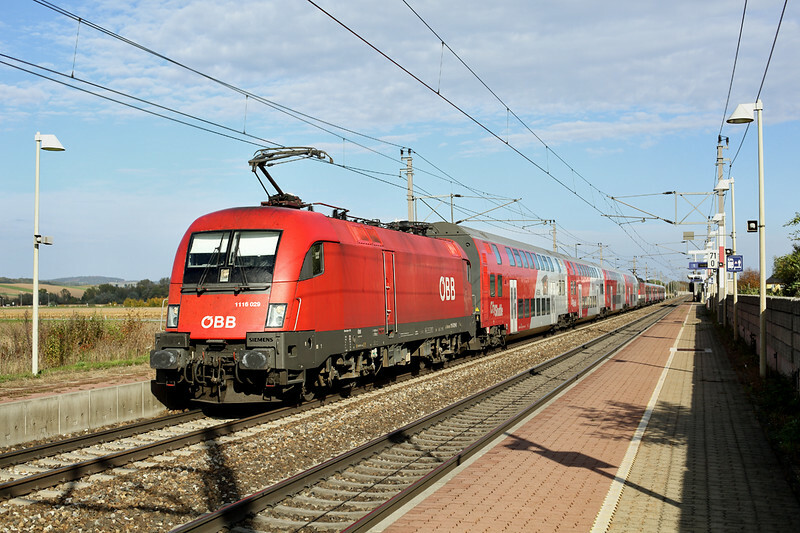 The two loco hauled trains were departing St Pölten at 0730 and 0830, the first of which was an 'ordinary' train using an old OBB liveried 1099, the 0830 was the Otscher Bar. All week there were only 4 engines used, two for each train, generally running on alternate days. Each day I went up the line I caught the 0730. Boarding at the first stop St Pölten Alpenbahnhof it was barely light enough for a shot as the train ran in. Whilst the first train up came straight back at 1053 from Mariazell, the Otscher Bar waits until 1553 to return so the same problem was encountered by the time that got back to St Pölten, seen above not long after I arrived in the town from Vienna Airport. 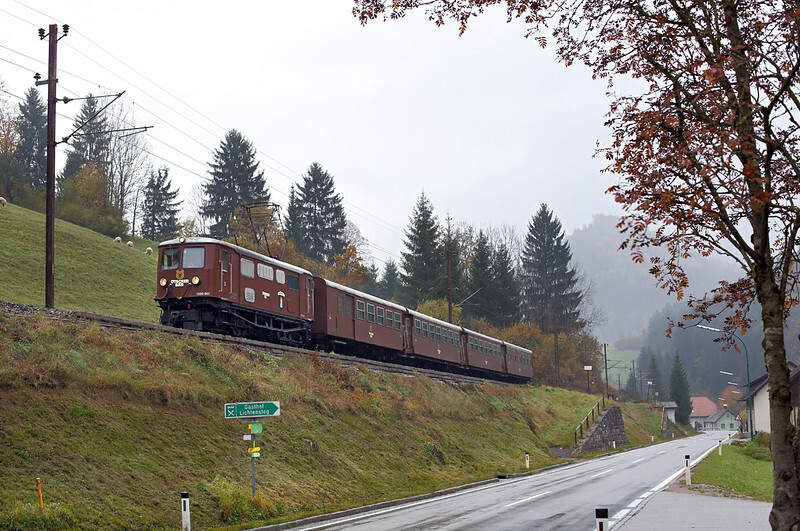 My friend Richard had visited the line a month previously and had recommended Frankenfels as a photographic location about 80 minutes journey time up the valley. Even when I arrived there just before 0900 the sun was barely getting over the top of the valley sides. A lucky small dip enabled a sunny shot of the train I had just got off departing the station and it was then a case of hanging around for an hour for the following service. The resulting picture is at the top of this blog. One advantage of going so late in October, despite the shorter days, is that if the sun comes out then the colours on the trees can be fantastic. Tuesday, my first full day, was also the only day where it was sunny virtually all day. It was a nice feeling to be able to get the shots I wanted on the first day as it took the pressure off the rest of the week. I had to hang round Frankenfels for a couple of hours to await the first loco to return from Mariazell but was rewarded with the shot below. With 5 hours until the Otschbar 1099 returned I headed back to St Pölten to spend an hour or two on the Westbahn, which is the principal Austrian mainline linking Vienna and Salzburg. Historically only two tracked a lot of work has been undertaken, and is still ongoing, to upgrade the line. As a result many of the stations around Vienna and St Pölten have been upgraded too and so aren't very photogenic. I alighted at Markersdorf two stops west where it is still only double track. Unfortunately out of the 7 freight trains I saw in 90 minutes, 6 were going the wrong way and the one that did appear managed to coincide with some cloud and also only had two wagons! Fortunately, during the afternoon at least, all the OBB passenger trains are loco-hauled with the engines on the correct end for the sun (the western end) including this odd working that I saw twice, the 1404 from Vienna to St Valentin, which is formed of a Taurus loco hauling double deck stock and also an older 1144 Electric on City Shuttle single deck stock both combined into one train. I returned to the Mariazellerbahn for the returning 1553 Otscher Bar. I had previously spotted a small bar at the end of Ober Grafendorf station so with open countryside around I went in the hope the train would come just before the sun set. Alas it went behind the hills a few minutes too early. Maybe the week before I would have been able to catch the last of the sun on it as it headed out of the town. Anyway I retired to the station bar afterwards. Shame the last train was only an hour later. On Wednesday the weather forecast was poor both around St Pölten but also in my intended destination of Hungary. There is a two-hourly Railjet train from St Pölten to Budapest so I used this to get to the border station of Hegyeshalom. 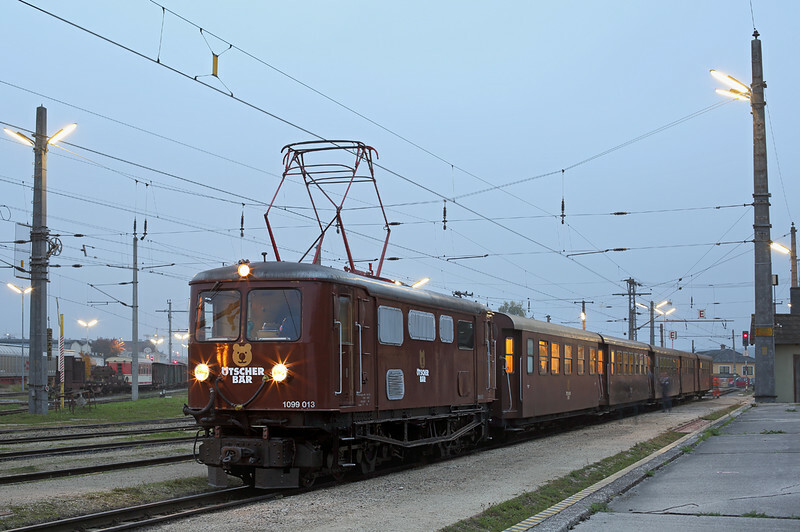 On my trip to Hungary last year we had failed to get a picture of any of the former British Rail Class 86s now in use with Hungarian open access operator Floyd, though passing we had seen a pair stabled at Hegyeshalom. There was one stabled down the yard and as is common abroad there was no trouble walking down to get a PICTURE of it. An added bonus though as I stepped off the Railjet was that an enthusiasts tour was just in the process of changing engines from a MAV Class 431 electric to this ex East Germany Class 01 steam engine, now preserved and owned by the Austrian rail history group OGEG. 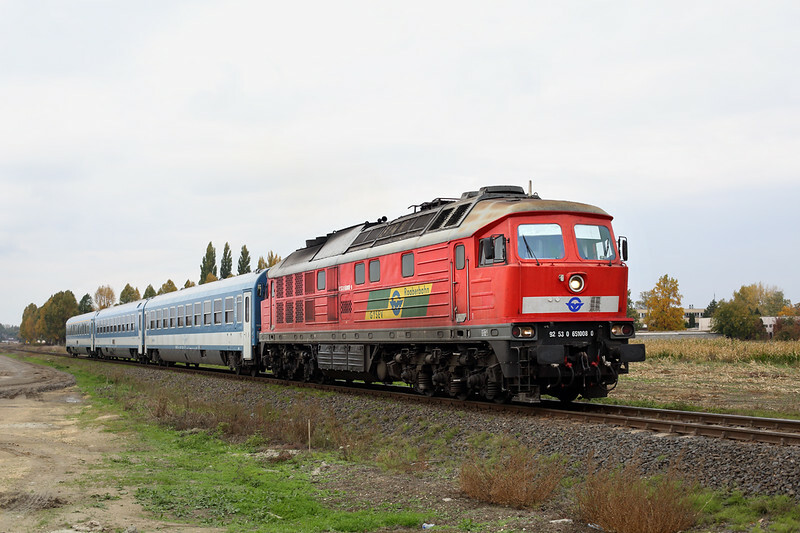 I spent two hours at Hegyeshalom but little else was moving during my stay, so caught the local unit that connected with the following Railjet south to Csorna where four routes meet, mainly operated by the cross border passenger company GYSEV. 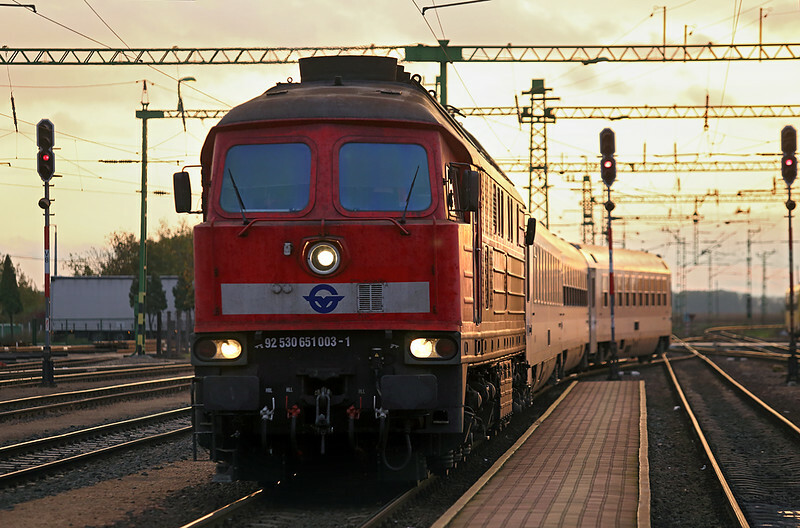 The target here was the two diesel diagrams they operate hauling portions of Inter City trains from Budapest on the non-electrified route to Szombathely. 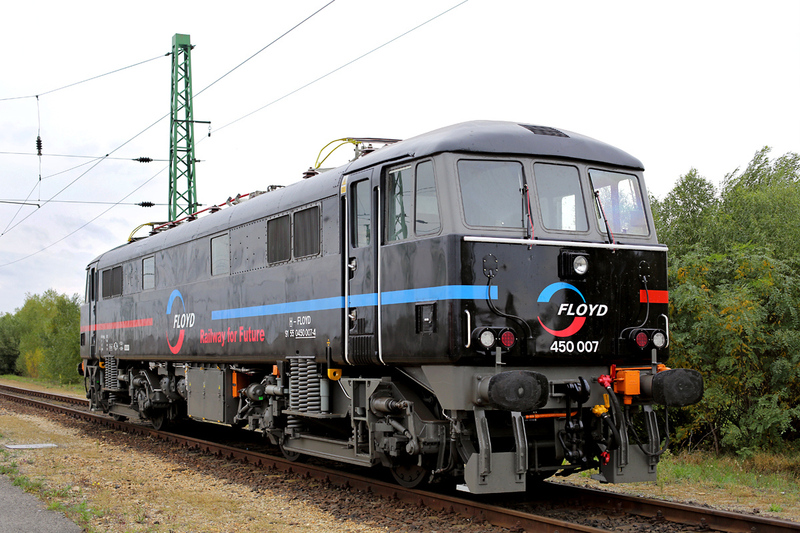 Recently GYSEV have acquired a handful of Ukranian built Ludmillas from Deutsche Bahn to cover their few diesel routes. One arrived just after I did and I was suprised to see it then disappear off light engine back to Szombathely. I was later to realise why. With the weather dreadful, an icy cold wind was blowing and it was threatening rain, I went to find a cash machine in order to get some Hungarian Forints to enable me to find a bar to shelter in whilst I waited 2 hours until the next Ludmilla was due. A mixture of forgetting what the exchange rate was and a schoolboy error in conversion meant I got out the equivelent of near enough £80 worth instead of the £20 I wanted! I did however find a German style Gasthaus which enabled me to have some dinner and some beer. I had to change the rest of the money back when I got home. Having not read the timetable properly I thought the next Inter-City arrival from Szombathely wasn't until almost 1800. There was however a departure the other way at 1600, hence my suprise when the loco had disappeared. There is a good level crossing 15 minutes walk from Csorna station on the Szombathely line which I had planned to go to. I was just approaching it when an Inter-City I hadn't been expecting went past. Not just highly annoying in itself but I also missed a one-car DMU that was literally right behind it whilst I was trying to work out what I had just missed. Being philosophical about things, I hadn't expected that other train to run so I didn't miss anything I was hoping to photograph. Despite the poor weather the shot of the Ludmilla coming back out from Csorna worked well and was what I had gone there for so I can't complain too much. I walked back to the station; I would have liked to get the shot of the next inbound IC here but it would have been pushing it to get back to the station to catch my train back to Hegyeshalom and Austria. Annoyingly the setting sun came out as it was due so it would have been a nice shot at the crossing. I had to, in the end, settle for a back-lit shot as it as it entered the platform with the red sun behind. My original plan was to do just the one day on the Mariazellerbahn. I found out though that whereas a return from St Pölten to Mariazell (in effect a day ticket) is about €29 a ticket for the whole line for all week is only €33 so it seemd churlish not to take advantage of this. Like on the Tuesday I went up the line on the 0730 train, got picture of that and its return, and also the 0830 Otscher Bar, then spent the afternoon down on the mainline before returning for the evening return 1099. Thursday was a right mix of weather. It was thick fog when I walked down to the station. 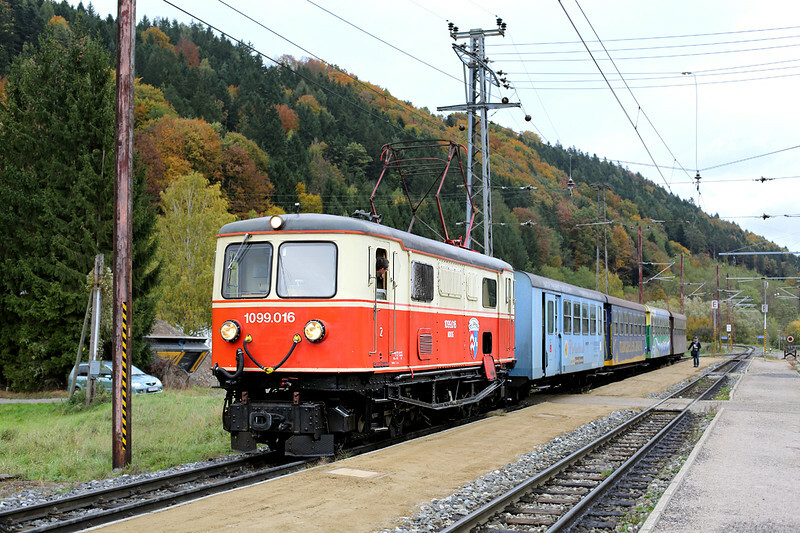 One of the lines 2095 diesels was just about to depart the Alpenbahnhof for Ober Grafendorf. There is an old depot there where the line's steam engine is housed. There were cranes on site so some vehicle was obviously to be shunted out and removed by road for some reason. I went beyond Frankenfels this time to the lines new HQ at Laubenbachmüle where a massive new visitor centre, conference and office rooms, and two three-road sheds to maintain the Himmeisteppe units has been all built in a large construction that takes up a significant part of the valley floor. The sight and sound of the 102 year old 1099 departing from underneath this massive new building was odd. Despite the prescence of the visitor centre and cafe, most of the hourly trains from St Pölten terminate 8 minutes down the valley at Frankenfels so, with 3 hours until the next southbound train, I walked the 7 km back down the valley along the road through the gorge. Halfway between the two villages is another, Boding, where I sheltered in a convenient bus shelter to await a photo. I enjoy walking and it was pleasant in the not too warm, not too cold drizzle, but I was a little wet by the time I boarded the unit at Frankenfels. This took me downhill to Kirchberg, the principal town in the Pielach valley. There is a cycle path running south alongside the railway and I utilised this for a shot of 1099-014 as it returned down the valley. I found a nice little kebab 'hut' in the town which served well for dinner. Not that it is something I eat often but Donner Kebabs in Europe always seem nicer than in Britain, plus of course in England you can't usually enjoy a beer with one! I got back off at the Alpenbahnhof to have a look round the adjacent depot. I asked a driver in my pigeon German if it was OK to go across the tracks to get some pictures. I probably didn't need to ask really as it is a very laid back place. 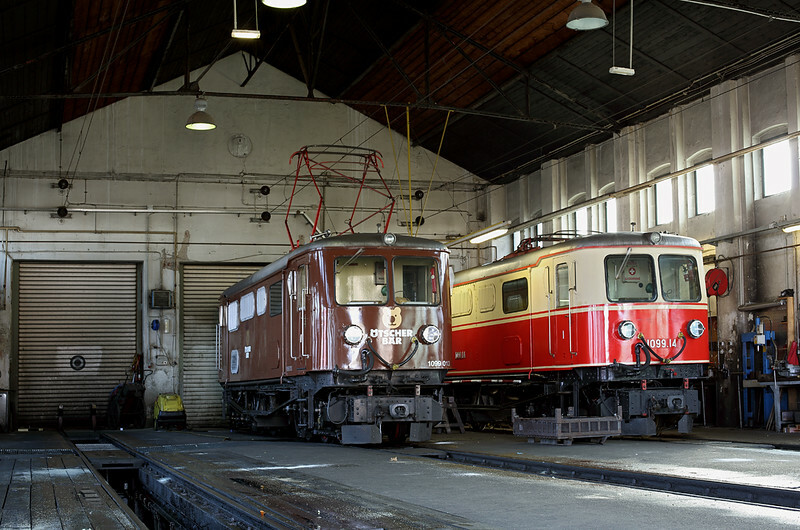 There are several lines of both 1099s and 2095s in the yards, some of which probably haven't been used for some time. They are all apparently on some kind of lease-back arrangement from OBB so there may not be a rush to scrap any of them once the main loco operations cease. I assume the Alpenbahnhof depot will be kept operational to maintain the two engines needed for next summers Otscher Bar trains as I can't see the brand new workshops at Laubenbachmüle having the facilities to work on these locomotives. Loosdorf was my destination for the afternoons brief mainline photographic jaunt. This isn't a bad station to photograph from the end of during the afternoon but unfortuantely a new section of line commences just before you reach this station meaning all the IC and Railjet trains bypass it, as did one westbound freight. Yet again most of the goods trains were going the wrong way. I returned later to Ober Grafendorf for a shot of the returning 1099 and a few beers in Gunthers Bar. For the week I stayed in the Pension Elisabeth in St Pölten. It was cheap enough, also a bit out of town and not of the highest standard, though it did the job. This was my first major European trip on my own so I needed really somewhere not too busy so I could sit in a corner quietly. The Hotel Alt Wien served food until around 9pm and I ate there two nights. Not the cheapest grub I had but it served my purpose. It is much more conveniently located than the Pension Elisabeth for the Alpenbahnhof; the rooms seem more expensive too but if I went again I would perhaps consider using that as a base instead. Of course there are plenty of hotels in the City Centre itself which would be even better located as a base for reaching the Hauptbahnhof each day. Between the Alt Wien and the Pension Elisabeth along the main road heading south was the best bar I found (excepting Gunthers at Ober Grafendorf). Bar Tritsch-Tratsch doesn't look very good from the outside, more like a roadside cafe, but it was the only one I came across serving a slightly different beer from the usual Lager/Pils, that being the excellent Hacker-Paschorr on draught. Anyway, back to transport. The final day I needed to get over to Salzburg for my Ryanair flight back to Stansted. At £23 this was very cheap, much more so than the £70 Easyjet gatwick to Vienna flight earlier in the week and, to be fair to O'Leary, it actually left and landed early. I still had time for one quick run up the Mariazellerbahn to Rabenstein, pictured above. I am certain that will be my last ever ride behind one of those engines. I wonder if now that they have, or shortly will have, finished in regular daily operation that the Hythe Pier Railway I visited last month (see Blog Number 48 ) is now running the oldest electric locos in daily service in Europe (dating from 1913)? 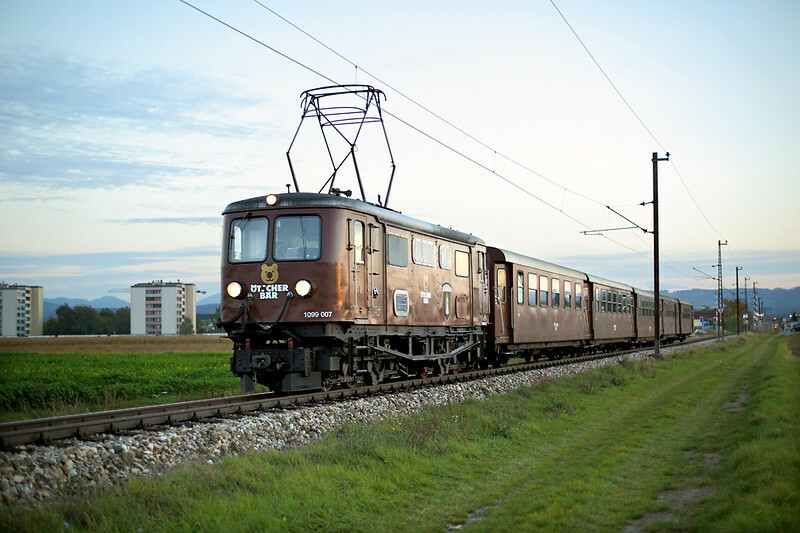 There is a regualr service from St Pölten to Salzburg, although the journey time is over 2 hours. Salzburg Hbf is being redeveloped at the moment and is really not much good for photography. I decided instead to have a quick hour sight-seeing. 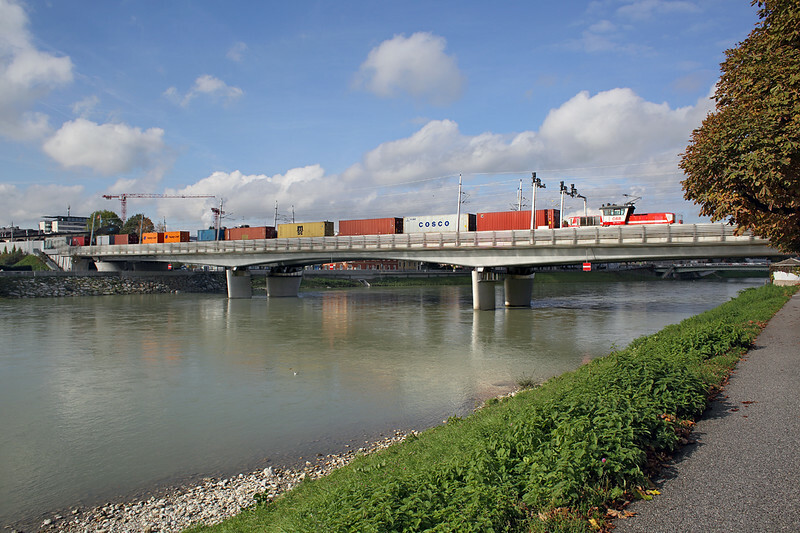 The line west from Salzburg crosses the River Salzach near the Old Town. I waited for a shot of an S-Bahn unit crossing the bridge. Rather fortuitously a cloud came over whilst it did, so I waited for the next one. Before that could appear two freight trains crossed which otherwise I wouldn't have seen, the first being hauled by one of OBB's class 1163 centre cab Electric engines, the second by a EuroRunner diesel. By the time I had hung around the river for 20 minutes it was time to get the Trolleybus to the airport. Salzburg as a City is somewhere I very much would like to visit again and see properly. To conclude, as I said at the beginning, much of this blog may not be of much use as the main reason for any Enthusiast to visit the Mariazellerbahn is now all but gone. I have visited Austria three times now, though twice only in passing through. There are still plenty of loco hauled trains to see, though the locomotive selection is in general quite limited with OBB and Open Access operators mainly using Taurus Electric locos. The 1142 and 1144 Class electrics still working on many local services are well worth photographing. I actually saw a MAV (Hungary) Taurus on a Salzburg local OBB train. I have no idea how or why, but proves there is still some limited variety. Thanks for taking the time to read this blog, I hope it is of some little use to someone planning a visit to the St Pölten area, or even to western Hungary. I'll leave you with a picture that shows in a small way why train companies in Continental Europe seem to just do things generally better than in the UK. In Britain, even on long distance Inter-City trains, the name of the game is to try and cram as many seats in as possible (try getting on a First Great Western HST). 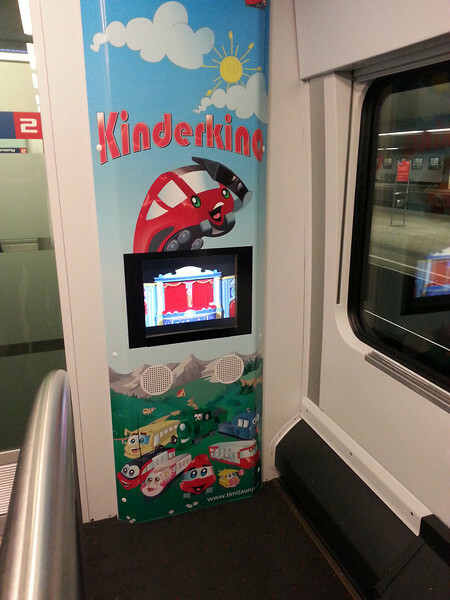 When building the Austrian Railjets, not withstanding the massive legroom they have in comparison to our trains even in Second Class, they also found room to 'squeeze' in a small cinema for children! Bye for now. Welcome to another edition of the Railwaymedia blog. As I had expected it has been about a month since the last blog was published due to having a week away in Italy and, consequently, needing to process all the pictures from there before I could get round to writing this. It was my first visit to the country; there's a diminishing number of (Western) Eurpoean countries I still need to visit, for railway photography at least. Luxembourg, Spain and Portugal are probably the main three. I might give Lichtenstein a miss as it only has 4 stations on a 10 mile line connecting Austria and Switzerland! Further east is probably going to have to be the aim for future trips: Latvia or Lithuania maybe; I would like to do Romania but I'm not keen on going there on my own. Anyway, moving on to the here and now, or rather the last few weeks, and this blog will mainly describe where we went and what we saw in Italy. 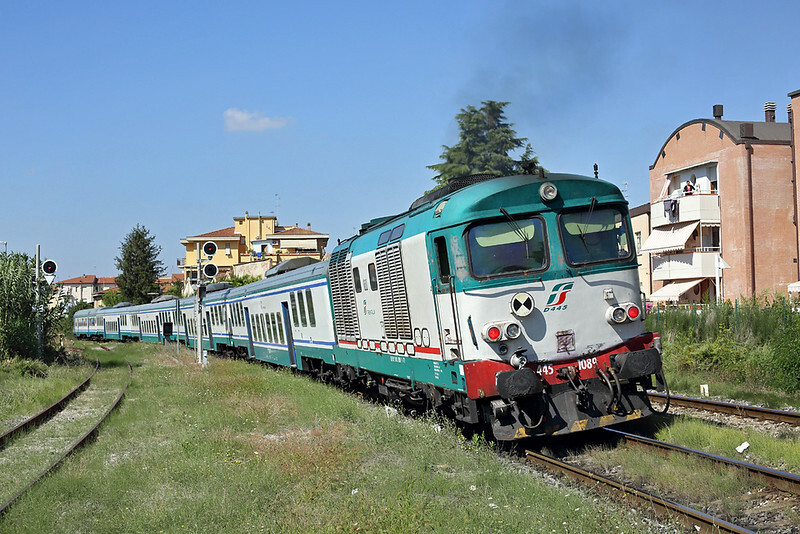 The principle aim was to see the FS (Ferrovie dello Stato) class D445 diesels, pictured above, as rumour has it they are being phased out over the next year or so. 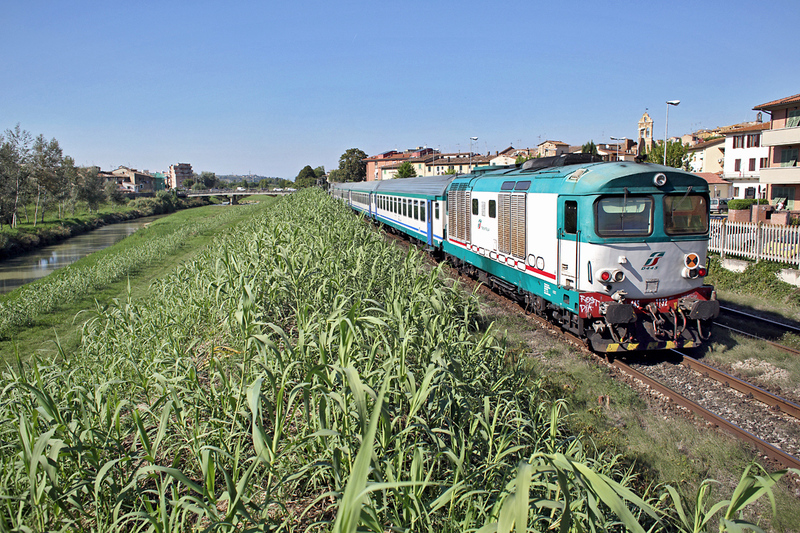 One of the principle lines they are used on is that from Firenze (Florence) to Siena. 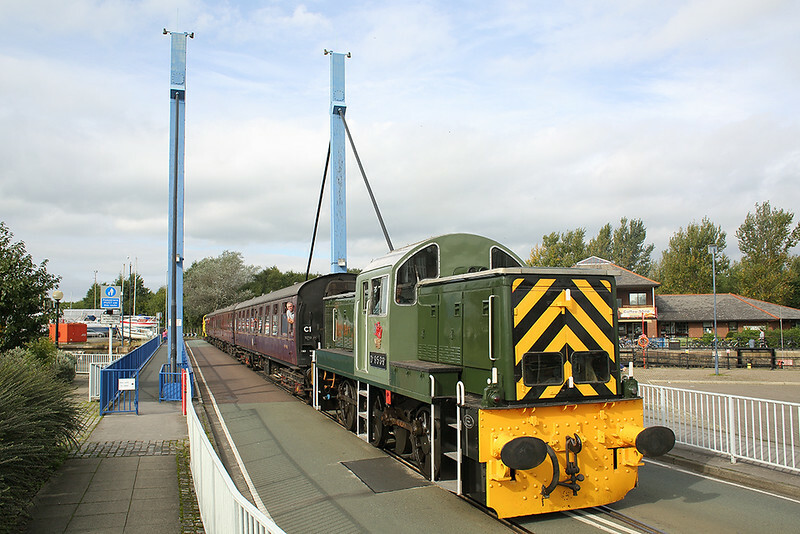 They haul a more or less hourly service, supplemented on the branch by additional DMU operated stopping services. They work in push-pull mode with the engine on the Siena end. With this line being our target we flew to Pisa with Easyjet. There are flights from the North-West but I chose Luton as the flight times suited me better. 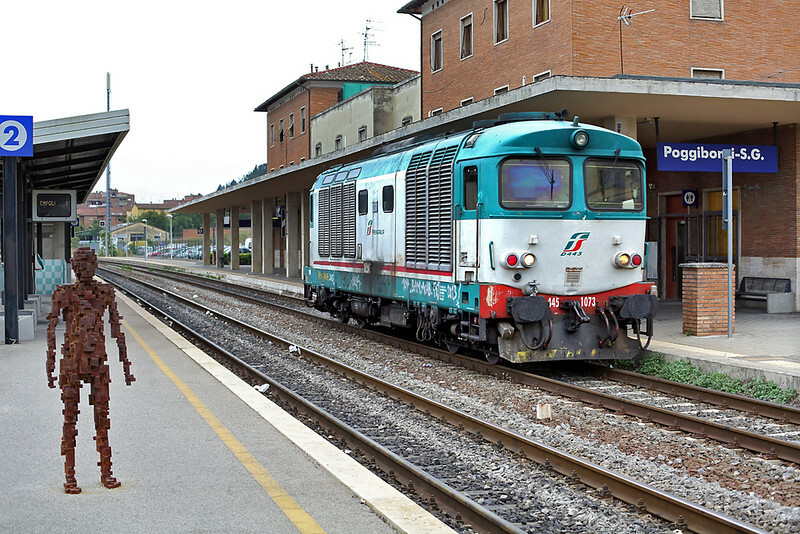 Pisa has an excellent small airport with two trains an hour connecting it to the main Pisa station, though it is possible to walk to Pisa Centrale in about 20 minutes anyway if you have just missed one. We stayed in the Hotel La Pace which for Italy was fairly reasonably priced. It also does a good buffet breakfast and being virtually right ouside Centrale station is handy if you want to take night shots of the sleeper trains. Before we needed to check in the hotel though, we had a few hours available to try to get a handful of pictures somewhere. Being September we had to find somewhere open in order to maximise the length of the evening light and to avoid the consequent long shadows. Many of the locations we used throughout the week were as a result of taking tips and looking at pictures from a website of a friend who makes many trips to Italy.Vada was one that looked reasonable for our requiremnts, although we discovered by ourselves this particular field 15 minutes walk north of the station. The two hours we spent here started our hatred (or perhaps that's too harsh: let us say annoyance) of FS's ubiquitous class E464 electric locos that are used on virtually all regional services. Now naturally loco hauled trains are preferable to units but as, unlike the Siena line trains where the loco is always at the same end, on the electric network there is no telling which end the loco will be. More often than not it is never on the end that you want it to be for the photograph. 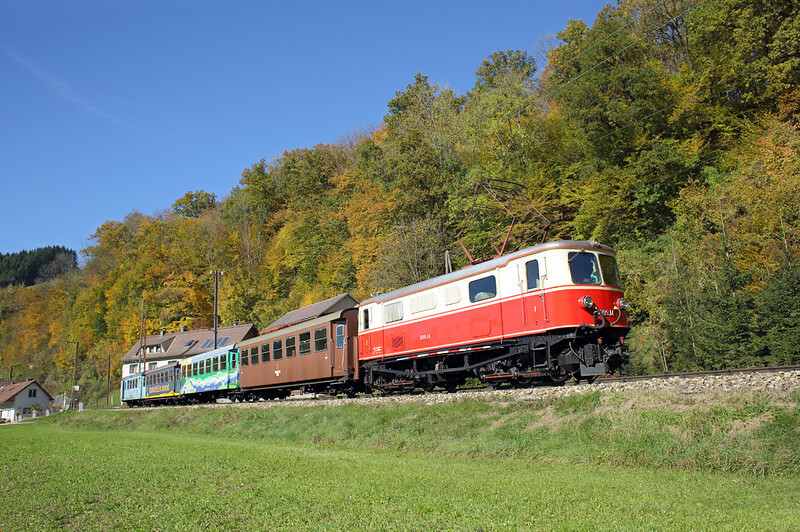 Our first full day was, with excellent sunny weather forecast, aimed at getting shots of the Siena line D445's. The main locations we used were centered on the stations of Poggibonsi, Castelfiorentino and Certaldo. The latter one, pictured above, is by far the nicest station on the line. There is a road bridge to the north of Poggibonsi (about a 20 minute walk) which gives good morning views: we took a picture of the 0910 from Firenze here, though the light would be better an hour earlier. At Certaldo I ended up going for a much longer stroll, bit by bit heading south trying to find a decent location. I ended up near the village of Basseto about 3 miles away. To say I was sweating in the heat was an understatement, but at least I got my best shot of the day from the bridge there. Meeting back up with Richard later we headed to one of the locations on our list, that being the river bank at Castelfiorentino. This is a good afternoon shot for Siena bound trains, and we could even nip to a local bar between photographs for a very welcome beer. With the shadows starting to lengthen we chanced our luck walking up to a bridge we could see to the north of the town. With the sun moving round and all the locos being at the south end of the trains there was only one more good photograph we could get of a D445, but with lovely evening light and an intersting backdrop it was worth hanging round for an hour to photograph a few of the intersting elderly units. The next day we decided to hit the 'mainline' to get some Electric loco pictures. We went south from Pisa, past Vada, to San Vincenzo where there is a decent morning location north of the town. 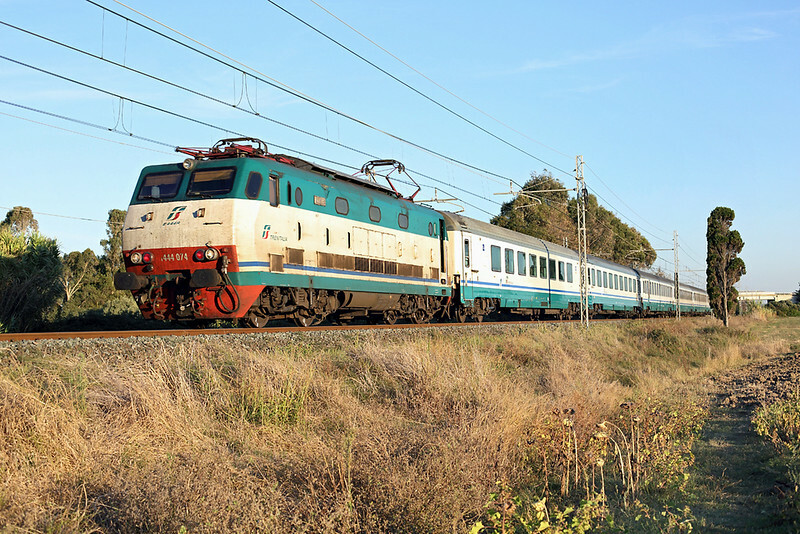 Unfortunately Italian railways seem to go very quiet on all lines between about 1000 and 1200 so we didn't get too many pictures, and needless to say any regional trains that did run tended to have the loco on the wrong end. 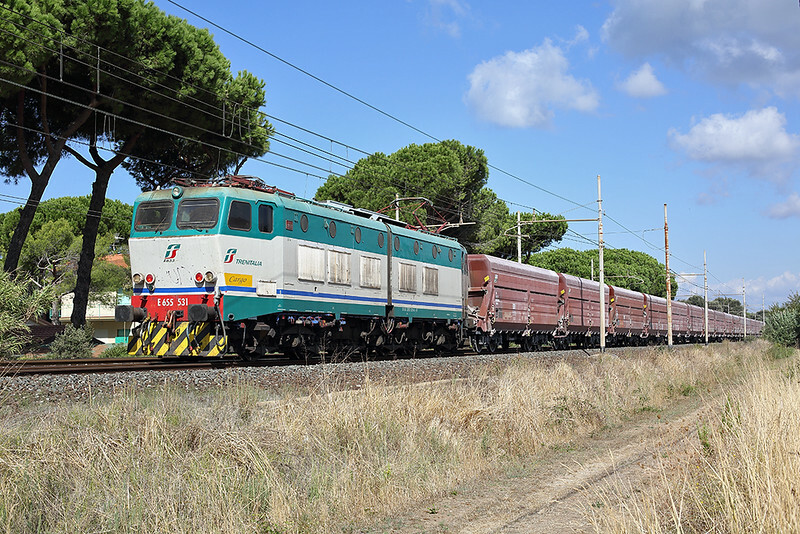 We did though see a couple of freight trains, one of those being a frequent trip working of limestone from San Vincenzo to Rosignano hauled by an articulated Class E655 loco dating from the 1970/80's which in total we saw 6 times during the day. This train was a bit of a life-saver for us as we saw little else all day apart from passenger workings. 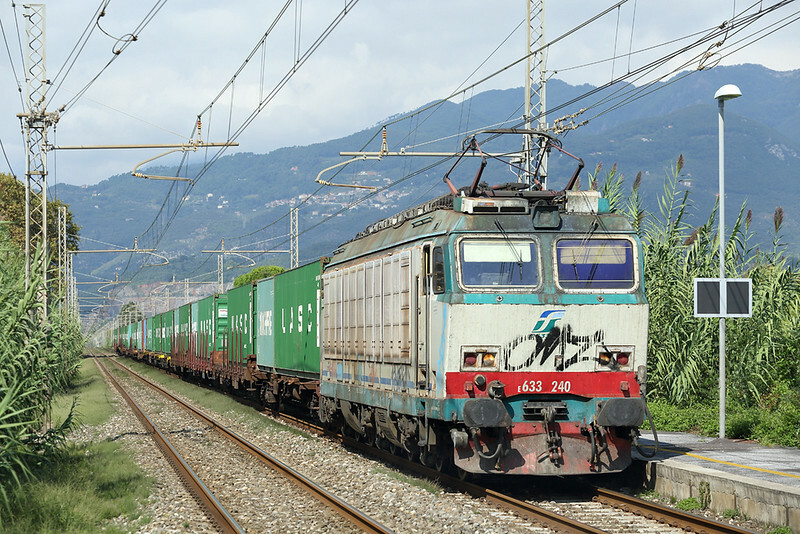 The line north of Pisa towards La Spezia appears to be much busier for freight, but there aren't as many good scenic locations for photography. During the afternoon we moved north from San Vincenzo to La California which is probably the best photographic location in the area though it is a long 40 minute walk from Cecina. We had maybe 5 hours in total there: fortunately there is a supermarket just before you leave the built up area of the town in which to stock up with provisions! There is a road bridge spanning the tracks and also a quiet lane running alongside the line, so from early afternoon through to late evening shots are possible one way or the other. 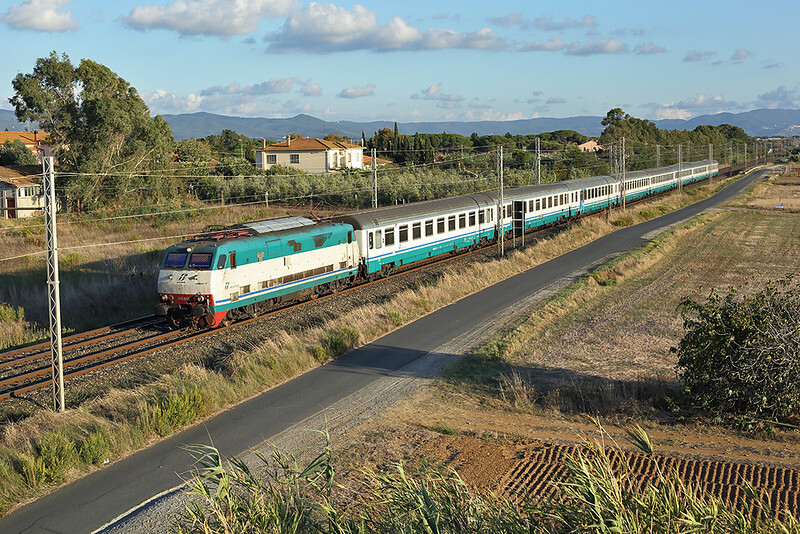 We had a choice of rushing back to Cecina station before the sun went down or staying for the last of the light and having two hours to wait for the last train to Pisa. In the end we chose the latter and had tea at the small bar outside the station, which was basic but cheap. Birra Moretti is probably the most widely available beer and is pretty good; pizza is unsuprisingly available everywhere. Even eating in a fairly posh restaurant in Pisa one night it was only about 7 Euro's for a pizza, beer was between 3 and 5 in general. I was warned Italy was expensive but didn't find that to be the case. 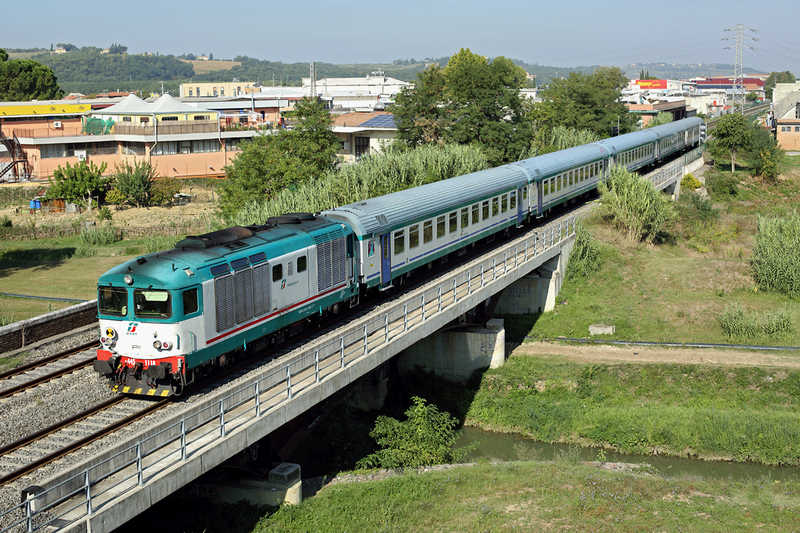 Day 3, and after a hour or two east of Pisa at Pontedera where we saw no freight trains, we decided to go north towards La Spezia. 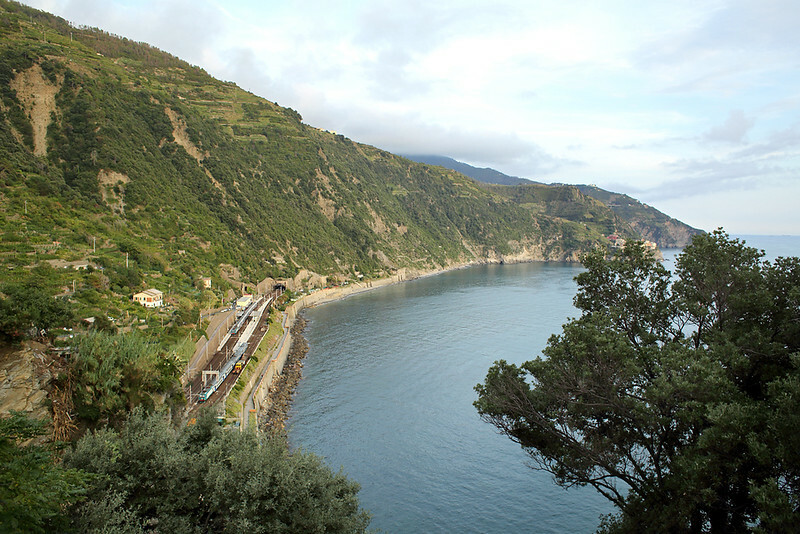 Richard carried on to the Cinque Terre tourist area whilst I had two hours at the small station of Camaiore. 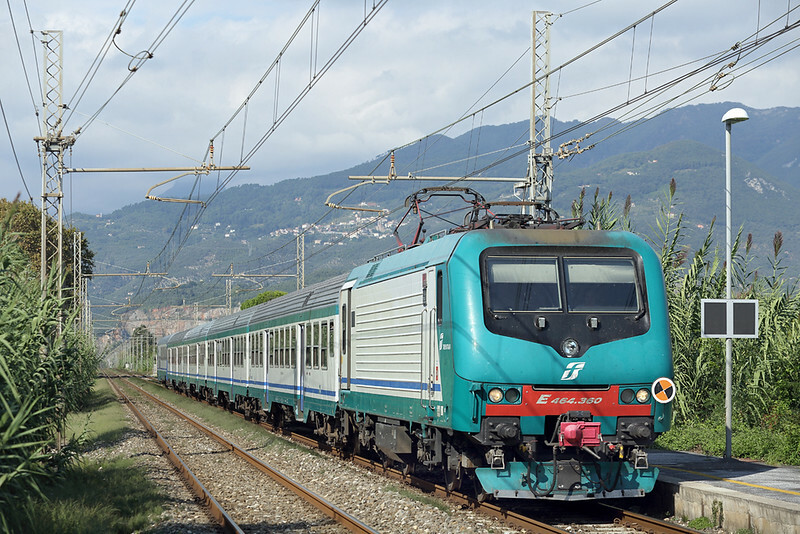 There are few trackside locations on this section of the line, Camaiore is probably the quietest and most picturesque station, but I was rewarded with a couple of freight trains and even the E464's were mostly on the right end of the trains for once. I then headed up north to meet Richard. The Cinque Terre is a collection of five villages clustured along the rocky coastline west of La Spezia and is extremely popular with foreign tourists. The railway engineering here is outstanding. There is no easy road access to any of the villages but the railway is hardly any better. From La Spezia the railway is almost continually in tunnel, indeed in the 44km between there and Sestri Levante 28km of it is underground, generally only popping out into daylight to squeeze in a station (some platforms are even in the tunnels themselves). 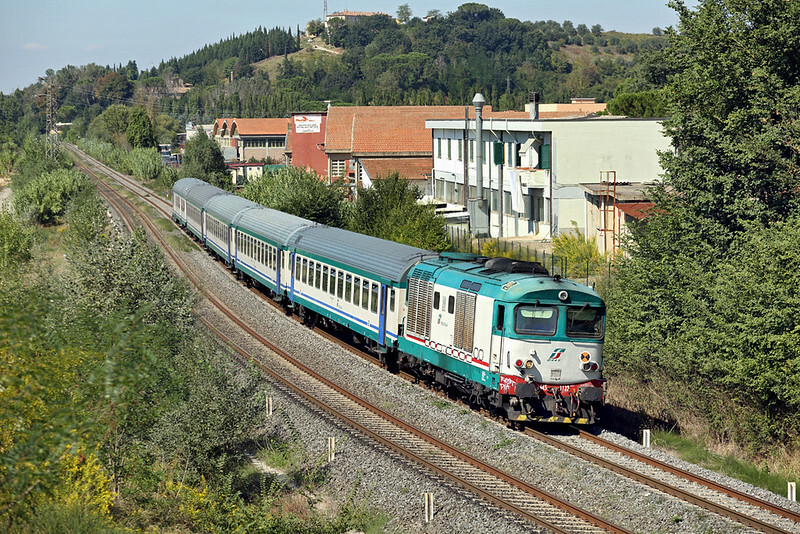 I alighted the train at the second of the five, Corniglia, just as I saw Richard getting on, so he spent the remaining hour or so of daylight at the next station along. There is a good location in the village of Corniglia overlooking the station and the bay, though it took a lot of climbing of steps. I also got bitten by loads of Mosquitos. Evening is perhaps not the best time to hang about there. 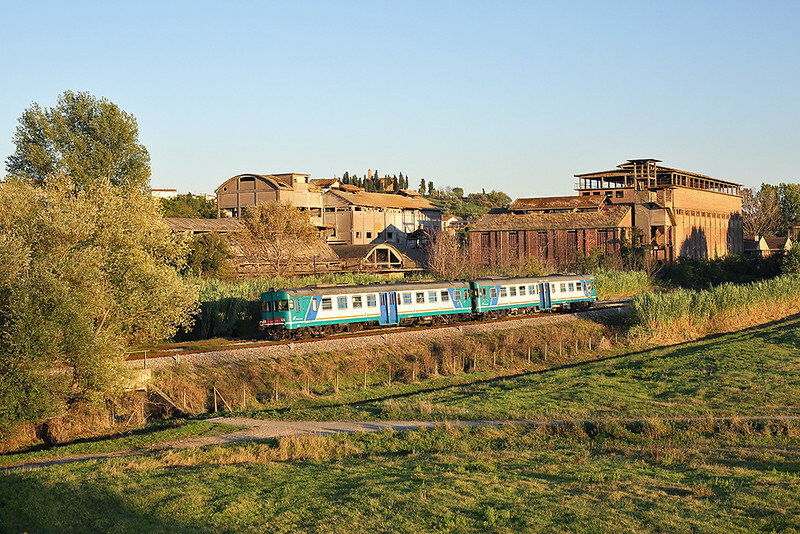 We were going to have our tea in one of the villages as they go noticeably quiter after dusk as all the tourists head back to wherever they are staying, but we were a bit anxious about the connection into the last train back from La Spezia to Pisa. In the end we went back early and finished the night in what had been a lucky find on our first night, namely the brewpub Brasserie La Loggia just outside Pisa Centrale station. It claims to be a brewpub, though apart from the standard lager the interesting beers were served only in bottles, but there were four on the menu to choose from; not particularly cheap but it was nethertheless an unexpected find. And they do pizza of course. With the flight back to Luton not until 4pm that gave a full morning to go out photographing. Getting some more D445 shots I felt was probably the sensible thing, though with a heavy bag to carry about and as the weather had changed and only started to brighten up at dinner time, I restricted myself to principally doing station shots. 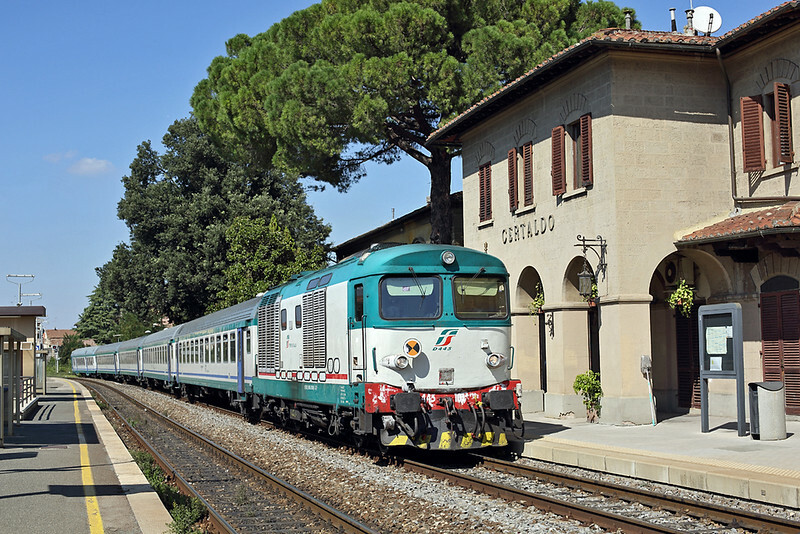 One thing I will say is that neither of us got any hassle from any railway staff during the visit, something I believe can occasionally happen in Italy. I camped out at Poggibonsi for a couple of hours, enforced mainly due to the strange mid-morning service gap I mentioned earlier. Ten minutes of amusement did occur though watching an English woman trying to use the station's self-cleaning toilet. I almost got to spend even longer there as the light engine pictured above broke down at the next station causing 30 minute or so delays, though the man here on the platform as it went through didn't appear to be too peturbed about it. All in all a good trip to cover a new country, if you are interested in the full selection of pictures I took they can be found HERE. I'm not sure if I would make a specific effort to visit again as, certainly with regard to passenger trains, with most regional trains having the same motive power and with rumours that the E464s might even replace the older E444s on the Inter-City trains, there is little new to see. Maybe a family holiday will be in order though, with the odd photographic excursion thrown in if I can escape for a few hours, to get some more scenic coastal shots. With having to fit in processing all the Italian pictures in between work commitments I have not otherwise got out with my camera this month, with the exception of two shots last weekend at the annual Ribble Steam Railway's Diesel Gala.This always seems to coincide with the weekend I have a kind of beer festival at my house which usually prevents me visiting on the Saturday at least. This year there were no visiting locos anyway as such so there was little need to nip down, though with Sunday afternoon turning out quite nice I did nip down the docks for some dinner and a shot of their immaculate class 14 diesel. It just needs some blinds in the headcode boxes! I have, though this hasn't proved popular at home, booked yet another holiday for next week. 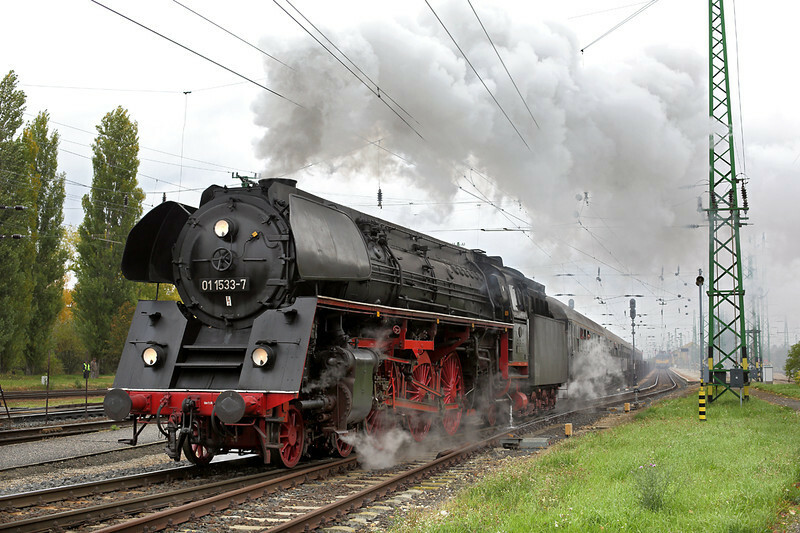 This one is to Austria to try and get some pictures of the 100 year old locos on the Mariazellbahn. With new units having been delivered this year it seems that 27th October is the final date, barring summer specials, that the class 1099 electrics dating from 1911 will be in daily service. Of course there will be more about the Austrian trip in the next blog, in the meantime thanks for reading this one. 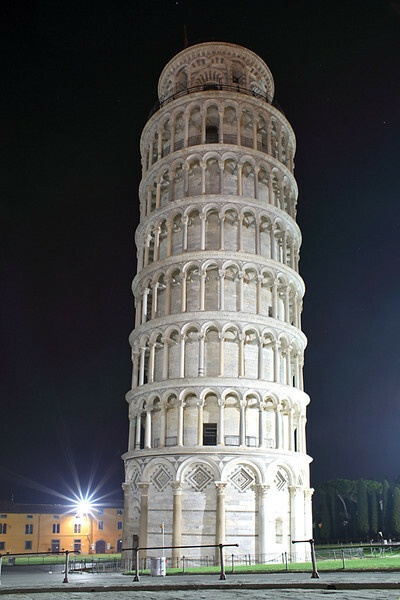 I shall leave you with the obligatory picture to take in Pisa. We went to see the Campanile at midnight, which was far better as it was much quieter; during the day it must be as bad as the Cinque Terres are for the numbers of tourists flocking about. Bye for now!